This exclusive slatwall shelving incorporates 2 essential store accessories in one! U hangrail includes shelf so you are able to hang clothes and display products together on your slatwall panels and displays. Maple laminated wood slatwall shelving with black rectangular tube hangrail. 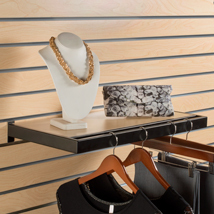 For further items, we encourage you to take the time to have a look at our thorough assortment of slatwall shelving at Specialty Store Services today.